By the time most women are 90 majority of their closet consists of nighties with baby food stains on them and green cross shoes that have extra space on either side for the bunions (after-effects of decades of high heels). Their days consist of breathing through an oxygen mask and playing bridge and talking about the ‘good old days’. 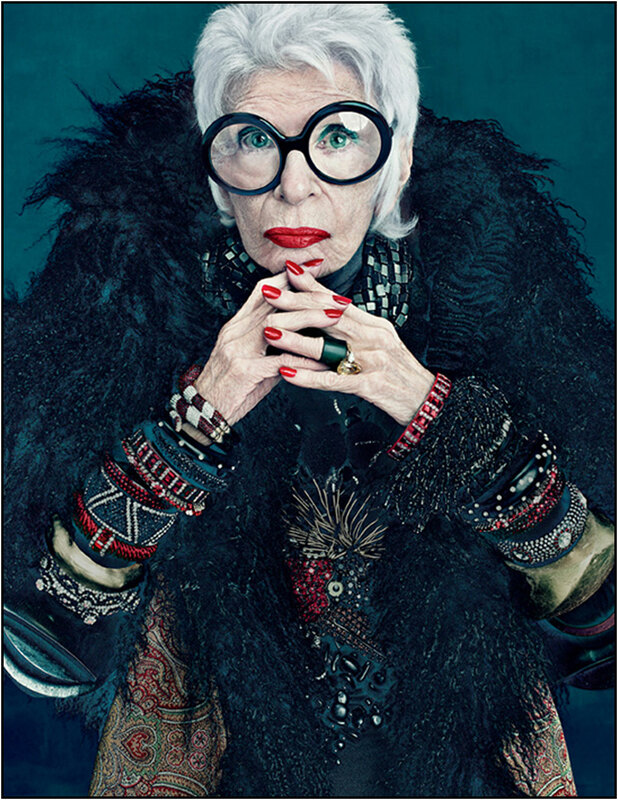 This is everyone except for Iris Apfel. I pray that by the time I’m 90 (an age that seems to be hurtling towards me faster than a taxi trying to make a yellow light) I will be as chic and regal as she is. M∙A∙C has released a colour collection featuring Lipsticks, Beauty Powder and Eye Shadows with as much flair and joie de vivre as the woman who helped create it. When I grow up I want to be just like you Iris! It really is a fantastic range. My favourite is the Robin’s Egg Eye shadow, available at a M∙A∙C store near you! And don’t be scared by the rather ghoulish but ever so fabulous looking picture of Iris in the window.